Researchers interested in meeting other researchers and learning about the latest life science solutions on the market are invited to attend Biotechnology Calendar, Inc.’s University of California, San Francisco life science event on February 6th, 2014. 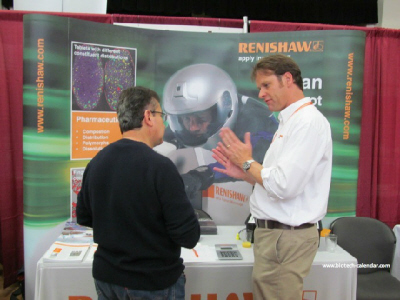 Last year, the San Francisco, Mission Bay Biotechnology Vendor Showcase™ Event attracted 280 attendees. This is the perfect opportunity to connect with colleagues in other departments and sales representatives interested in hearing about your work’s successes and your problems in the lab. At our University of California, San Francisco life science event, we will be offering a number of prizes to attendees. One of the fun prizes we give away is our Science Ninja t-shirt. At past events, researchers and other attendees have received t-shirts and taken pictures at our photo booth. To see some fun pictures of Science Ninja t-shirts and attendees in the photo booth, please view our Instagram photos. When you attend a Biotechnology Calendar, Inc. show, you also have the opportunity to win the drawing for an event prize, such as an iPad. Our event sponsors have a prize table where you can find lanyards and gift bags in case you’re not the lucky winner of the iPad. Biotechnology Calendar, Inc.’s University of California, San Francisco life science event is also a place where you can meet other researchers for lunch. Our catered lunches include menu items such sandwiches, vegetable trays, brownies, lemon bars, bagels and cream cheese, cookies, coffee and tea. Take some time away from the classroom or the lab to meet other researchers at the University of California, San Francisco, or to network with lab suppliers who may be able to suggest life science solutions that will make your research processes easier. Lab supply companies are eager to meet researchers at our University of California, San Francisco life science event this year. Sales reps will want to hear about what you’re working on and what problems you encounter in the lab. By talking with sales reps at Biotechnology Calendar, Inc. shows, you may be able to find the missing puzzle piece to your research that saves you time, money or waste. Our University of California, San Francisco life science event is also the perfect opportunity to catch up on what your colleagues are working on in the research lab. Perhaps you’ll have insight into their work that can make or break a study. Similarly, a colleague in another department may offer you a way of looking at a problem that you hadn’t thought about before. Biotechnology Calendar, Inc. invites researchers, purchasing agents, post-docs and lab managers at the University of California, San Francisco to attend our San Francisco, Mission Bay Biotechnology Vendor Showcase™ Event on February 6th, 2014. Researchers interested in learning about life science solutions and meeting other researchers at life science events closer to home are encouraged to view our 2014 calendar of events. Biotechnology Calendar, Inc. is a full-service science research marketing and events-planning company that has been organizing life science events at top research universities for over 20 years. For more information about the San Francisco, Mission Bay Biotechnology Vendor Showcase™ Event, please click on the button below.